Nathong Farm is a young farm, set up in June 2017, after Kithong decided to leave the construction sector to become a full time farmer and his own boss. He built a modest house on his parents in law land, so far unexploited, and started rearing poultry, growing vegetables and fruit trees while learning on the job. This small-scale integrated organic farm of 8 ha is mainly made of forest where 5 cows graze happily. 1.7 ha are dedicated to crops, 1 ha for rice and the rest for a large range of vegetables and fruit trees. Kithong rears chickens and frogs for sale and consumes fishes from a fish pond recently dug. 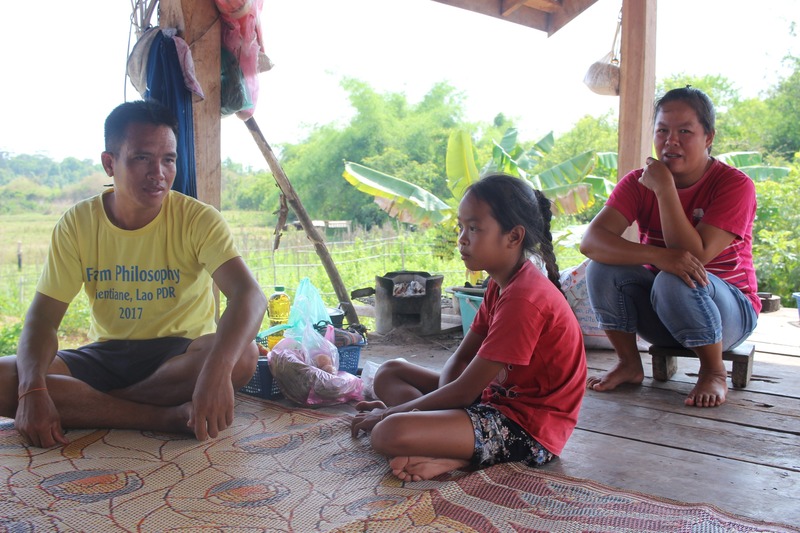 Kithong gained knowledge about agroecology practices by working closely with Soumboun, a young organic farmer from a nearby village. 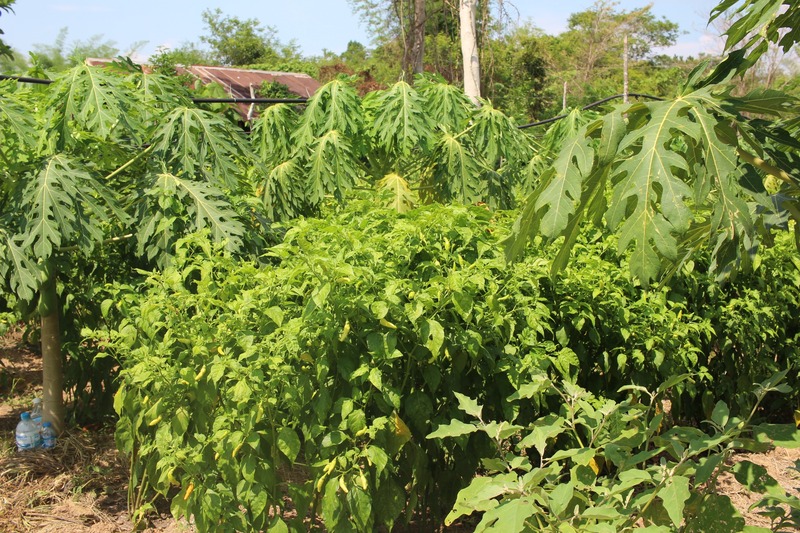 In Nathong Farm, a high diversity of vegetables grows next to fruit trees. 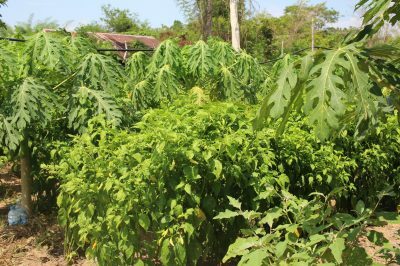 Chilli peppers and eggplants are intercropped, benefitting from the papaya trees shadow. Depending on the season, morning glory, carrots, beans, salad, celery, spinach and many local herbs can be found. To boost the soil fertility, Kithong uses various agroecological methods such as composting (pig, cow dung and chicken feces mixed with black rice husk), intercropping, rotation (morning glory-mustardspinach-onion-parsley and corn/pumpkin, gourd and beans), and mulching with rice straw and herbs collected from the farm or the forest. He invested in the construction of a well and self-built an efficient watering system with sprinklers so that the crops never suffer from water shortage during the dry season. 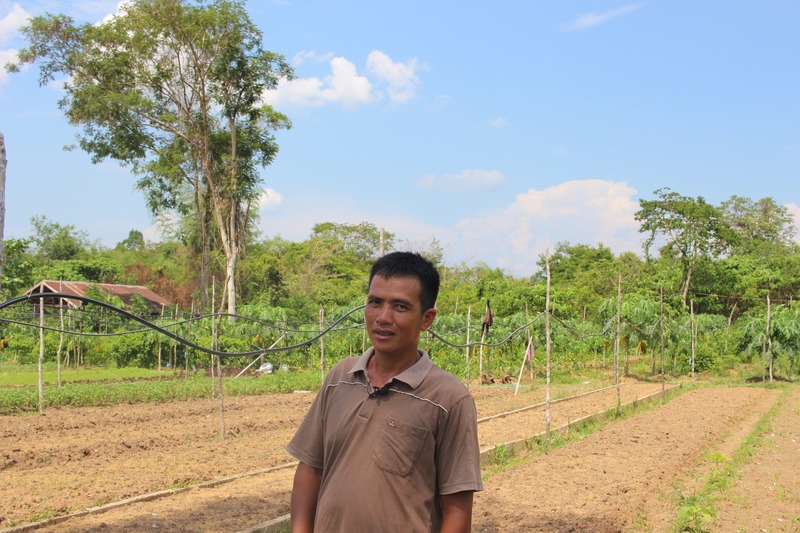 When comparing the income generated by his former activity as a worker in the construction sector and the income generated by his new activity as a farmer, Kithong says it is comparable. 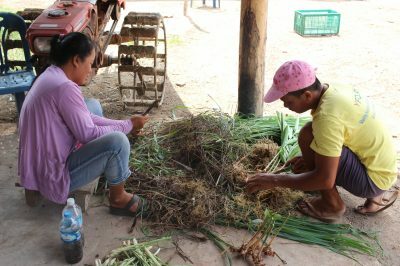 Moreover, his new activity provides him with the freedom to plan his work on the farm, decide when and what to sell and he believes his source of income is more regular and stable now. Besides, Nathong farm is a self-sufficient farm, producing what it needs for household consumption, hence reducing the dependency towards global market.